The two types of spherical mirrors are concave and convex. Each type reflects images in a different fashion. This is due to the curve of the mirror. A good example of how a curved mirror alters an image can be seen in a fun house mirror. The image reflected back can make a person look tall and skinny or short and fat. A concave mirror is one that curves in like a bowl. The image is seen inverted. The image can be smaller, the same size or magnified depending on the distance from the concave mirror. A convex mirror is shaped like the outside of a bowl. The middle of the convex mirror is raised from the edges. Images will always appear erect and virtual. The size of the image will be reduced. Aberration may occur when using a convex mirror if it is not a parabolic mirror. A parabolic mirror uses a surface that is a revolution of a parabola. Images cannot be seen well on a true spherical reflective surface. 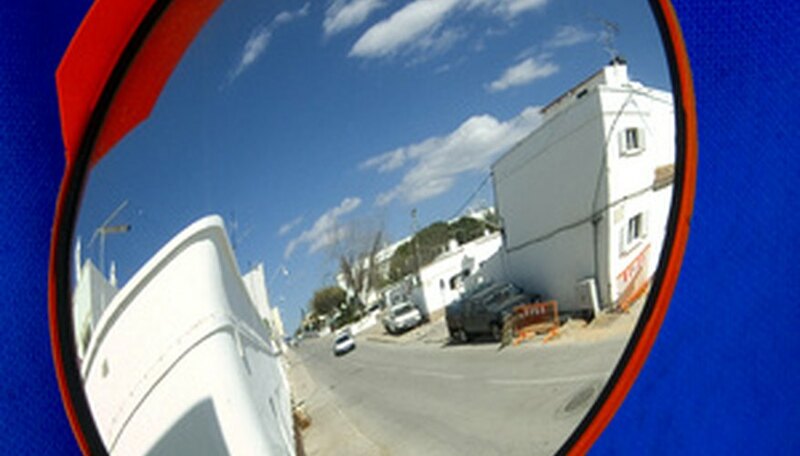 Most convex mirrors today are made with parabolic mirrors. Blakesley, Kim. "Types of Spherical Mirrors." Sciencing, https://sciencing.com/types-spherical-mirrors-7228359.html. 24 April 2017.